Action: Choose FILE > New show. Explanation: choosing this menu item gives you a basic show with the default text. You can change this text with the Textbox in the upper left corner of the tool window. Action: Click the Create Key button. A small vertical line above the Time slider (the big slider on the right) is now visible, representing this key. Explanation: to make smooth animations you only have to define a few keyframes and BluffTitler computes all the in between frames. To create an animation you need at least 2 different keyframes. Action: Drag the Time slider (the biggest slider) all the way to the right. The text above the slider now says: '00:03.000' which means 3 seconds. Explanation: in order to create the 2nd key we first have to change the current time. Action: Use the Property sliders (the 3 sliders) to change the scene. Drag the lowest slider to the left until the text completely fills the screen. Explanation: all the effects you can animate are listed in the Property dropdown (the dropdown above the 3 sliders). The default property is Position. In this mode the 1st slider controls the horizontal, the 2nd the vertical and the 3rd the depth position. 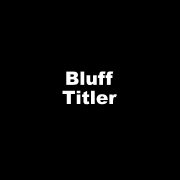 To move the text towards the camera you change the depth position. Notice that a keyframe is created automatically when you change the scene. Action: Click the Play button. All the things you can animate are listed in the Properties dropdown. This is the dropdown above the 3 sliders. In this tutorial we have animated the text position. If you know how to animate 1 property you can animate them all! You can change the property itself with the 3 sliders. Most properties have 3 components. For example, when selecting Position the 1st slider controls the horizontal, the 2nd slider the vertical and the 3rd the depth position. When selecting Rotation the sliders control the heading, pitch and roll. When selecting Colour the sliders control the red, green and blue components. A keyframe (key) is a set of properties at a specific time. To produce an animation you need at least 2 different keys. BluffTitler computes all the frames in between. Every key is represented by a small vertical line above the time slider. You can select a key by clicking on it, or by pressing the Previous key and Next key buttons. You can edit keyframes with the buttons above the time slider. 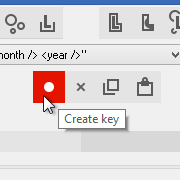 Keys can be moved, copied, pasted and deleted. 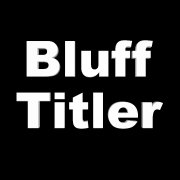 A BluffTitler animation is built out of layers. Every layer has its own effects. For example with the text layer you can create 3D texts, with the picture layer you can place a picture in the background and with the plasma layer you can create plasma effects. 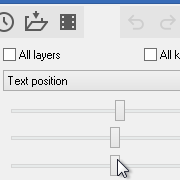 All layers are listed in the layers dropdown. This is the big dropdown above the Play button. You can edit only a single layer at a time. You set the active layer with this dropdown. You can create a new text layer with the menu item LAYER > Add layer > Add text layer. 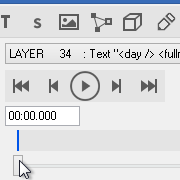 All the other layers can be created with other submenus of the LAYER > Add layer menu item. You can delete the active layer with the menu item LAYER > Delete active Layer. A show is built out of layers. A layer is built out of keyframes. A keyframe contains properties you set with the 3 sliders.